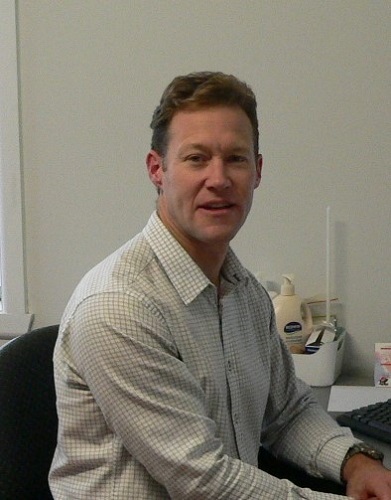 Mark graduated from La Trobe University, 1996 with the Bachelor of Physiotherapy. He has worked for the past 20 years in private practice using a variety of treatment techniques, such as mobilisation, manipulation, McKenzie method, core strengthening (including Pilates), massage, exercise regimes and hydrotherapy. Mark has a hands-on approach to treatment, and has been trained to use dry needling to desensitize trigger points located in muscle. Mark first developed a keen interest in sports injuries while working in Ballarat for a few years after graduating from university. Training with an athletics squad, competing as a professional sprinter (including competing at regional events such as the Stawell Gift), playing a few seasons of professional football, and then working as a trainer with local football clubs, Mark was exposed to many different types of sports injuries. During his work in the United Kingdom for 2.5 years in an Orthopaedic (outpatient) setting, Mark was involved in the rehabilitation of chronic conditions, general neck and back pain in the elderly, middle-aged, as well as paediatric patients. He also was a Physio at the 2000 Sydney Olympics, treating a wide variety of elite athletes. After leaving behind professional sprinting, Mark now enjoys competition tennis on Saturday afternoons and enjoys watching his children play tennis. Mark is looking forward to this next stage of his career, running his own practice and embedding himself in the local Casey and Cardina communities. Due to the Physiotherapy Clinic’s central location, Mark treats patients from surrounding suburbs, including Berwick, Beaconsfield, Beaconsfield Upper, Narre Warren, Officer and Pakenham.